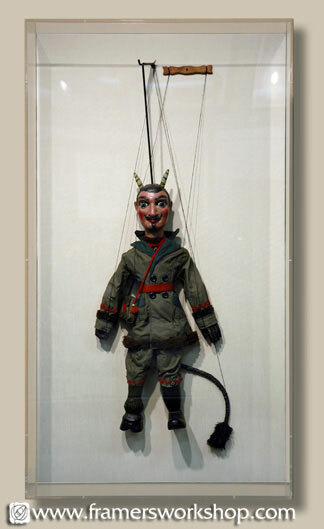 This antique puppet presented a challenge as the client wanted all of the mechanism to show. We had an acrylic box frame made to accommodate the depth, and lined the backing with linen. Our custom framer then used specialty hardware to assemble the finished project. The puppet hangs in space with all of its original strings and supports intact.